New clients give feedback on their experience on the first visit. Sogno asks our new clients for feedback on their experience on the first visit. They are rated 1-5 FIVE being the best. From the beginning we have promised to take care of our clients. We promise the trendy modern styles, highly educated stylists in a clean, friendly atmosphere. Here the latest survey: 1) How would you rate your experience at our salon? 2) How would you rate the professionalism at the front desk? 3) Were you happy with the quality of the salon service? 4) Would you recommend our salon to a friend? 5) Can you tell us one thing you really liked about the salon? 6) Can you tell us one thing that you didn’t like about the salon? Sogno is known for makeovers. Ambush makeovers, Vugly hair makeovers contests, and makeovers for cancer patients. So when Aili asked us to be part of her new look we were very excited. Aili had grown her hair out for Wigs for Kids. Our favorite charity for children’s hair loss. For over 30 years, Wigs for Kids has been providing Hair Replacement Systems and support for children who have lost their hair due to chemotherapy, radiation therapy, Alopecia, Trichotillomania, burns and other medical issues at no cost to children or their families. We hope you enjoy Aili’s new look. She is! Sogno Salon is proud to participate in National Breast Cancer Awareness Month. Yes, there is good etiquette for a haircut. 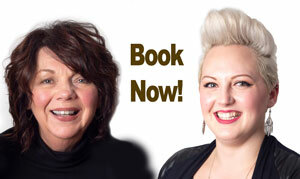 If as a client you wish to receive the best haircut then let us explain how it works. The first thing is of course communication. You may bring pictures. It is very helpful. A picture of yourself 20 years before? Remember you and your hair has probably changed. And do you really want to look like that again? You had the best haircut you ever had in Paris, but why? It’s the why the haircut worked not where that you need to communicate. By the time you have expounded on your Paris hairstylist we know we are never going to make you happy. Could you just have been in love with Paris? Keeps your hands out of your hair after the stylist starts cutting. Would you stick your hands in the middle of anyone else’s work. Chef, nail technician, painter? It’s frustrating, it moves the sectioning making it difficult to cut and distracts your stylist. And it’s just darn rude! Keep your head straight and legs uncrossed. Your body position is very important. If you are so worried that you have to be in control of each little snip you will NEVER get a great haircut. Go to a trusted stylist that has good references. Talk about your feelings, dreams and fears in the beginning. Then sit back and enjoy the time. Your stylist wants only the best for you and probably can give you that Paris cut. If you put your hands in your lap. Team Sogno recently spent eight days in London to attend the Vidal Sassoon Academy. From the heart of London, the Sassoon courses are developed, developed and designed to be contemporary, relevant and forward thinking and are delivered with passion, commitment and technical excellence. Sogno Salon, Rheal Day Spa, Change Fashion Consulting, and Amy Wilton Photography announce the Free Makeover Contest All you have to do is send a picture of yourself and tell us why you want a makeover. Email: info@sognosalon.com Deadline is January 25 at 5pm. Save Monday January 27 for your day of beauty! Refer your friends to our Facebook, have them “like” our page, and tell us who sent them! You will be entered into a drawing for a $100 gift certificate and our new friend will be entered into another drawing for a $50 gift card. The more people you refer, the more times you will be entered into our drawing. All participants will receive a gift bag of goodies if they stop by to pick it up. Contest begins January 1st and ends January 31st. I’m pushing my salon’s products because they’re better for your hair—not to make a few bucks. Sogno Salon stocks products we believe in. We’ve tested, researched and met with the company. It’s frustrating for us to see a client pay good money for great color or a trendy cutbut then buy drugstore shampoo and conditioner to save a few bucks. We can tell you exactly what you need to maintain your hair—and save you from playing the drugstore guessing game. We here to give you the right advice and we will gladly exchange anything that’s not working for you. Can Walmart do that for you? Why would you want to work at a progressive salon?